The Philippine Center for Investigative Journalism (PCIJ) has made available the text of the special issue of iReport commemorating the 20th anniversary of the Edsa Revolution. Interviews with twenty individuals, such as Cory Aquino, Imelda Marcos, and other major players and representatives from all walks of life, indicate how much—or how little—has changed twenty years after that historic event. One year later, the economy seems to be better, but politicians are as disappointing as ever. And the Aquinos just seem to be sinking to new depths all the time. The "Kris and Borgy" billboards weren't exactly Kris Aquino's fault, but was there any excuse for the "Cory and Loi" show? Read "The Aquinos Today: What would Ninoy say?" 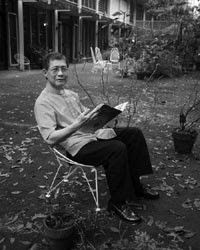 (Philippine News, 28 February 2007), and see for yourself how Ninoy's family seems to have all the bases covered when it comes to political scandals—from showbiz intrigue to sibling rivalry to turncoatism. On a personal note, last year, all I could do was link to the podcast and share the "outtakes" from the article that I contributed to the special issue (see "Fr. Archie Intengan on the Church Today"). Well, you may now read "Romeo J. Intengan" by Vernon R. Totanes =) Please note that it has a page 2.